The Stiga Vertical Table Cover is designed to fit the table in vertical folded position only. It is high quality and very heavy-duty. Cover measures 70" wide x 61.5" tall. Depth at top 18.5", Depth at bottom 31". Includes zippered storage bag that is 19" x 14"
I purchased this cover from Paddle Palace after checking out the usual sports stores. If you are considering a cover for your fold up table, spend a few bucks extra and buy this cover. It is a heavy duty, quality cover that is made to last. 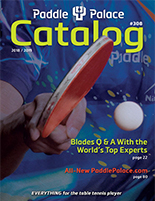 Im very pleased with this cover, and I appreciate the helpful folks at Paddle Palace.